They really enjoyed it and found it very interesting. They enjoyed using the technology and were quite adept at scanning the codes once they had tried a couple of times. The codes are all placed in locations that are accessible. The iPod Touchs worked really well – the touch screens and the amount of ‘touch’ needed to use the QR code reader app was good. Again I’m glad that we used text as the result of the scan rather than a URL as no matter the level of the learner, they want instant results. 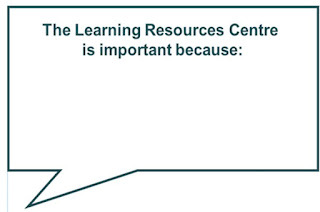 A short informative message is ideal that can be read from the screen by the learner or by the tutor or facilitator. (I'm now wondering whether it would be possible to have the text automatically read aloud when the code is scanned?? - I'll have to investigate). Advantages and disadvantages of using online collaborative platforms for meetings, events, training and lessons. This is an update from the post I did last year about using online facilities for meetings and conferences. The obvious advantages remain the same e.g. saving travel costs, saving travel time, saving venue costs, saving space within organisations. The technology provides a range of features including video and audio and feedback options such as voting. The quality of the platforms is improving and the quality of the equipment that is available for presenters and participants is also improving. Yet some of the issues still remain and haven’t changed much over the last year. Some presenters continue to use it as a way of broadcasting their views to a captive audience without considering how it is being received. Some of these issues are based on the technology – it is essential that the sound and vision quality are very good. This applies whether it is a meeting, an event, a training session or a lesson. It is uninspiring and disappointing to be participating in a session where, especially the audio is of poor quality. It is difficult to concentrate on the content as you get distracted by the technology. The other issues are based around the type of session that is being delivered. This is the crucial factor – delivering an event which is mainly the broadcast of information is very different to a meeting or to a training session. Such events rely on the information being interesting and engaging and the recipient not getting bored or disengaged by the poor technology. Personally I would prefer the presenter to be in a more formal environment than their sitting room but as long as there are no distractions then it works. Meetings online are easy – all you have to do is check that the audio works, that the video works and that you know how to use the screen sharing facility. Then you use the same skills as a real meeting – having an agenda and other papers and making sure everyone can participate in whichever way you choose. Raising hands is a useful facility for this as are ‘smiley face icons’ and the chat facility if need be. Training sessions and lessons are a different matter. We have been trying out different methods of delivering training and information sessions using online web conferencing / collaboration. The important factor to decide is how much interaction with the audience is needed and the type of interaction. It is not strictly true that the more interaction the better but if the session is split into smaller parts with some information displayed and then some interaction e.g. chat, poll etc. then the audience remains engaged. The displaying of information and screen sharing is the factor that has in fact been the most difficult – not because displaying a PowerPoint or document is difficult but that it takes practice to do it seamlessly and move between the different options. Any slight mistakes are amplified – the presenter needs to swap between desktop sharing, application sharing and presentation sharing without hunting desperately for the right option. When it works, it works well but takes practice, a lot of practice. Student feedback - short and snappy? Is collecting feedback from students becoming increasingly difficult when, in theory, you would expect it to be getting easier? Due to the wide variety of online facilities that are available, it should be easier to reach students and gain their views. You would think that with the technology available you would be able to use email, texting, QR codes, voting response systems to collect data from a large number of respondents quickly and easily. To a large extent this is true i.e. it is much easier to create surveys and questionnaires and distribute them through a variety of electronic channels to a large audience of potential participants. It is very simple to collect the data / feedback / views and collate it and produce a report with colourful graphs - this takes one click! But the problem is that surveys and questionnaires are so numerous and widespread that they are either ignored or filled in in a cursory fashion. This is true in many areas, it is not just a student issue - everyday there are requests by email or via social media to complete a questionnaire. These questionnaires are mostly valid and genuine requests as there is great pressure on organisations and institutions to collect feedback to inform changes and developments. The customer voice or student voice is very important. Therefore the dilemma is that there is increasing importance attached to the creation of questionnaires and the collection of the results but decreasing importance on the filling in and responding. In our Learning Resources Department we have tried to use a variety of methods of collecting data through questionnaires and surveys. We have an annual questionnaire which covers library and e-learning issues and we disseminate it online through a link on Blackboard and have paper copies too if required. We get a good response but it takes encouragement and persuasion. Incentives and prizes don't make a lot of difference unless you offer something really expensive and also ethically I don't agree with giving prizes for such activities. One of the most effective ways of collecting student views we have found is by either asking students one question and noting down the answer or by using cards - a bit like comment cards. The important part is the face to face interaction - most of our students are very helpful and happy to respond. The advantage is that if it is just one question then they don't feel like you are imposing on them or taking up their time. (In reality, once you've asked one question they are happy to discuss more). 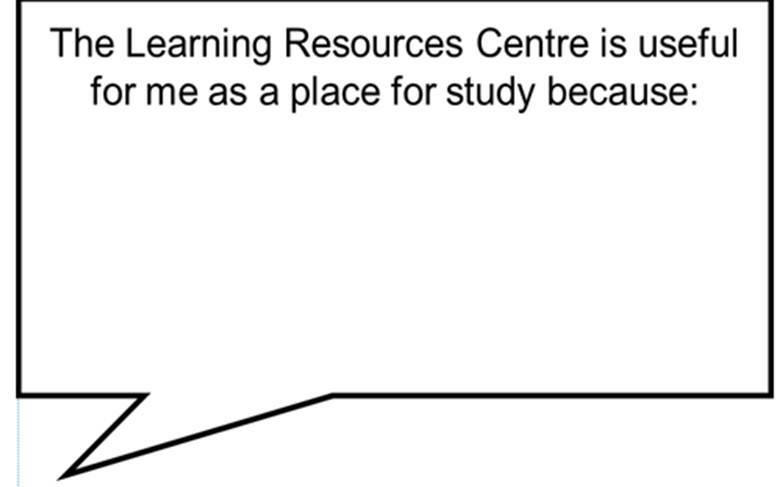 At the beginning of this month we used cards to ask students for their views about the Learning Resources Centre as a learning space. This was prompted by the fact that there are going to be changes which will affect the Learning Resources space and we wanted to find out what students felt was important. There were two separate cards and rather than tick boxes we left space for a comment. The questions were quite general but do match up with some of our targets and performance criteria. We handed the cards out to students from the LRC counters and enquiry desks and encouraged students to fill them out there and then. Over the period of two and a half days 311 cards were completed. The responses were excellent and very insightful. Students were very co-operative and volunteered to fill in the cards and also to talk about why the LRC space was important to them. They also mentioned that it was good to be able to write general comments rather than answering specific points. These themes were identified very quickly and we will do some more analysis of the results and pick out some examples of useful comments. 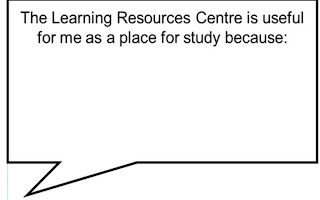 The encouraging thing is that students appreciate the learning space, that they want somewhere quiet (although their definition of quiet is somewhere not silent but with low level noise) and that they want computers and books and resources. I appreciate that this is not necessarily a robust method for gathering data - it relies on face to face contact and our sample were users of the LRC but it is valuable and it is the 'student voice'. The important point now is that we do analyse the responses, that we do consider them and that we do try to incorporate them into future developments. This is where it becomes less easy - we now have to manually sift through the responses, we have to read them and collate results and type up the data and make a report etc. The collection has become easier, the collation has become harder. A short and snappy survey has worked for us in this instance and has been really interesting - we will use it again but will also continue to use online questionnaires through our VLE and through student response systems. Run of the mill, nitty gritty..
Today, the Monday after a half term was a normal, busy, nitty gritty day - lots to do but mainly admin and managerial tasks. No meetings or events just non stop organisational operational tasks. Monday is quite a good day for this as it's sometimes preferable to concentrate on getting things sorted at the beginning of the week to enable a trouble free time. Today we had quite a few LRC staff off sick so I covered counter duties for a break and an hour or so this afternoon. Authorising holidays, external events, training sessions, sickness etc. Confirming room bookings and checking spreadsheet for the training room. Liaising with the ICT staff trainer re training sessions and skills updating. Arranging updates and training. Reviewed information cards for the 3D Wayfinder. Arranged hospitality for events and visitors. Emailed update to line manager regarding recent events and issues. Worked on documentation and plans regarding possible changes to the LRC space. Emailed update to stakeholders and arranged update meetings. Produced draft report. Updated information and documentation regarding our LSIS Leadership in Technology project which is based on using online collaboration environments. Uploaded updates to the project Blackboard course and to the blog. Reviewed JISC call information and emailed various interested parties to keep them up to date. 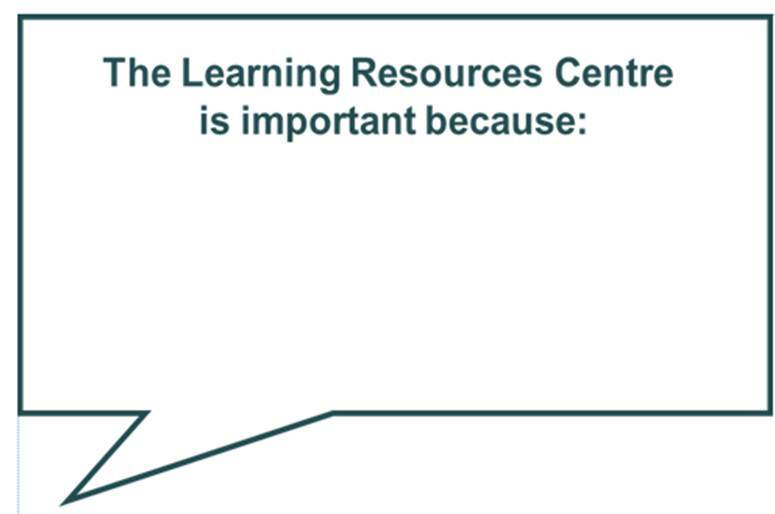 Summarised the results of the comments cards that we used to collect data and feedback from students regarding the LRC space and their views on its usage. Why should Learning Technologists care about libraries? As a learning technologist it is a reasonable question to ask - why should I support or even care about libraries? What have they got that I want or need? If I need any information or want to find out about something I can just use the Internet on my computer, or even more easily, on my tablet or smart phone. If I want to read a book I can use my eBook reader or my phone or download a podcast. As a learning technologist my purpose is to use technology to help people learn and teach and enable them to use electronic methods of communication. One of the main advantages of using technology is that it means that learning can happen 'anytime, anyplace, anywhere' - so why do I need the library? The simple answer is that learning technologists need libraries in the same way as most other educationalists and people involved in education do, as a place that can be used to access information. No matter how useful and interesting a resource is, there has to be a place and a device or machine to access it from. It may be the case that many people including students have their own device to access the resource but not all and in some situations not many. There has to be an open access learning space that provides computers and internet access for users and a place for people to use their own devices and connect to WiFi. This learning space needs to be somewhere that is suitable for independent learning so not a classroom or teaching room. More importantly to learning technologists there needs to be some support and expertise in case of difficulty in accessing the resource - if a student can't access the VLE then the brilliant resource that sits there will not be of use. If you can't access the system then the online help is not accessible either. So there needs to be some face to face support in an accessible learning space and this face to face support needs to include expertise. Expertise to access learning resources but also expertise to support access to information and knowledge. An important aspect of using learning technologies is information literacy and digital literacies which are vital - there is too much information available out there to access it randomly. It is impossible to use information without there being an awareness of how to use it and how to judge relevance and appropriateness. These are all skills that are ideally provided by libraries - they provide a place where information can be accessed with the help of expertise to search for it and evaluate it. The information needs to suit the user and there are still many instances where the information that is most suitable is not in electronic format. Books are still essential although gradually they will become less in number in a paper based format and there will be more diversity of format and more open access publishing. There is no point at this stage saying that books should be dispensed with as ebooks are available - it's not true, yet. Libraries know they have to change and are changing - lots of librarians are learning technologists and vice versa (although neither side is likely to admit it). Technology is used to good effect in libraries and is the way forward - as long as people know how to use it. So stepping out of an educational environment into everyday life, how do people access information and knowledge - how do they find out about something? There has to be a place where people can access resources. It's easy to forget as a learning technologist or as someone who works in an educational environment that not everyone has access to a computer or even knows how to use the internet or can afford to do so. There needs to be places that are free and accessible and provide expertise and support in order to enable everyone to find the information and knowledge that they want and need. Libraries do this.